The Cold War was by and large better than its reputation, especially in hindsight. It imposed, as never before, a kind of long nuclear peace upon the global powers and forced minor players to conform. 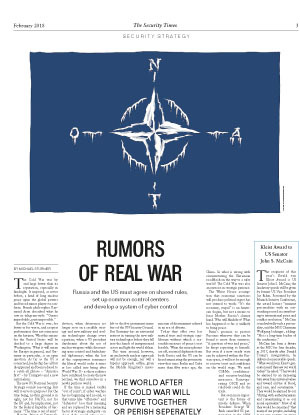 French philosopher Raymond Aron described what he saw in telegram-style: “Guerre improbable, paix impossible.” But the Cold War is over, for better or for worse, and a repeat performance does not seem near on the horizon. What this means for the United States will be decided to a large degree in Washington. What it will mean for Europe in general, and Germany in particular, is an open question. As far as the US is concerned, leadership has all but disappeared and been reduced to a catch-all phrase – “America first” – by Trumpists and a new nationalism. The new US National Security Strategy sounds reassuring. But will it serve its purpose? For the time being, no firm ground is in sight, not for NATO, not for the EU and, by implication, not for the Federal Republic of Germany. “The time is out of joint” – Hamlet, Prince of Denmark, is often quoted these days, even in the most unlikely places. If taken seriously, this means that nothing less than a new security architecture is in order. 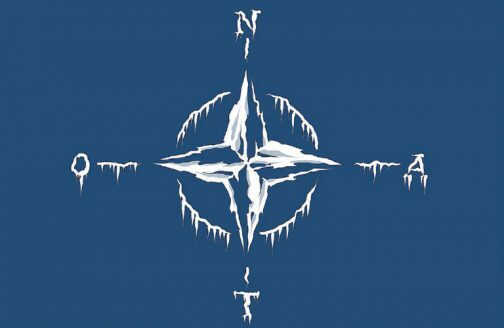 In the face of an unreconciled Russia, NATO must be redesigned with a much more coherent European contribution, and Europe reinvented accordingly, Brexit or no Brexit, Trump or no Trump. The mantle of leadership is there to be seized – but there are few takers willing and able to act while the world is in such turmoil. The Federal Republic of Germany? A reluctant leader at best, a wholly ineffective one at worst. When the US refuses to carry the burden of the world, like Atlas in Greek mythology, leaving old friends to their own devices; when deterrence no longer rests on a credible strategy and new military and civilian technologies change every equation; when a US president daydreams about the use of nuclear weapons while discounting arms control and backchannel diplomacy; when the last of the superpowers renounces the liberal world order it more or less called into being after World War II – as these realities have combined to create the new normal, we find ourselves in a newly perilous world. If the time is indeed visibly “out of joint”; if cyber warfare has no beginning and no end, so that terms like “offensive” and “defensive” lose their meaning and are replaced by a menacing factor of strategic ambiguity – in short, if the world refuses predictability while the strangely familiar logic of MAD becomes imponderable, what is there to do? Deny reality and close your eyes or panic and prepare for surrender? We are living in ever more interesting times, where everything depends on our ability to reconstruct trust and predictability and to put a new correlation of forces, unstable as it may be, into treaty language and verification practice. The world after the Cold War will survive together or perish separately. It is time for an agonizing reappraisal of NATO and the idea of international order that it represents, including its limitations and its achievements. And it is simultaneously time for a new Russia policy, one that avoids the somewhat dated concept of a distinctively German Ostpolitik. As Henry Kissinger tends to remind us, the demonization of the man in the Kremlin does not suffice as a long-term answer to the dangers of our era. In this effort, Germany is not the lonely but inevitable mediator and moderator – this is better left to the five permanent members of the UN Security Council. But Germany has an existential interest in taming the new military technologies before they fall into the hands of inexperienced actors and light the world ablaze. This time around, however, an exclusively nuclear approach will not be enough, nor will a bipolar approach suffice, given the Middle Kingdom’s inexorable rise. As they did after the Berlin and Cuba crises of the early 1960s, the powers must once again discover their ultimate dependence on each other’s reasonability as well as their vital interest in finding a formula to ensure long-term survival. Once again, this will require the cultivation of strategic dialogue and, unavoidably, the abandonment of a number of preconditions. If the big nuclear powers are not on speaking terms with one another, confidence- and security-building measures of all kinds will have no chance. To a certain degree, the situation reminds observers of the confrontation between the superpowers, a half a century ago. President John F. Kennedy demanded the “agonizing reappraisal” of America’s nuclear posture, including its long-established strategic wisdom. Through this radical, unorthodox approach, Kennedy prepared the way for strategic arms control. Arms control and a measure of disarmament ushered in an era of détente. Today they offer ever less mutual trust and strategic equilibrium without which a reasonable measure of peace is not feasible. When the microphones are off, seasoned diplomats from both Russia and the US can be heard enunciating the pessimistic view that since Berlin and Cuba more than fifty years ago, the world has never been so close to war – real war – as it is today. The foremost challenge is to find a way out of the confrontation over Crimea and Eastern Ukraine. All that has happened since early 2014 – the annexation of the strategic peninsula, hybrid warfare, half-hearted sanctions by both sides and US threats to supply defensive weaponry to the front – has not reversed Ukraine’s territorial losses while it has cost Russia space for political maneuvering, economic comfort and West-facilitated modernization. The Kremlin can ill afford this kind of posturing between half-war and half-peace. The longer critical oil prices remain where they have been for quite some time, the more Moscow stands to lose. Given the rise in uncertainty, the question remains: Is it sensible to turn the Crimea Question into the shibboleth of East-West relations? Who stands to win in the end? Not Russia, not the US, not the West as a whole, but China. So what is wrong with circumventing the Ukrainian roadblock on the way to a safer world? The Cold War was also an exercise in strategic patience. The White House assumption that economic sanctions will produce political regret has not seemed to work. “It’s the economy, stupid” is an American slogan, but not a means to force Mother Russia’s clumsy hand. Who will blink first? What has happened so far is unlikely to bring peace. Putin’s promise to protect Russians wherever they can be found is more than ominous. “A question of war and peace,” he keeps repeating to himself. But even if a new steady state can be achieved within the Russian space, it will not be enough to recover trust and confidence on the world stage. We need CSBMs: confidence-and security-building measures. Reinvigorating OSCE and its rulebook could do the trick. But even more important is the future of missile defense. When President George W. Bush cancelled US participation in the ABM system, he put paid to a well-balanced regime that had proved its worth. It is essential – and in the interest of both sides – to once again agree on shared rules, set up common control centers and develop a system of cyber control. Cold War management of the nuclear standoff through limitation and verification is not an unfeasible solution for dealing with new and largely untested technologies. However, the Cold War experience is a stark reminder that an exclusively military-industrial approach will not suffice to revive trust and reliability. What is required is Russian self-restraint, a broad-based Western Ostpolitik, a thorough understanding of the relevant history and geopolitics as well as an appreciation of the new technologies and their disruptive potential. In other words, we need a combination of statecraft and bold diplomacy. Biding our time to see what comes next is the worst of all options: a leap into the dark with open eyes. is an historian and journalist. He has been chief correspondent for the German daily newspaper Die Welt since 1998.